Erosion can be a major problem for Kansas farmers: with every downpour or major weather event, precious topsoil slides away from arable fields. This eroded soil can leave large, unplantable tracts in what should be rich agricultural land. One such type of erosion yields larger rills called ephemeral gullies: they often form in the same place year after year and although they can be removed, it all adds to the farmer’s management time and cost. Not much is known about the effectiveness of current practices for the reduction of ephemeral gully erosion. Some producers use terraces or winter cover crops to mitigate the problem. Others try creating obstacles or artificial swales to stop gully formation. It’s a time-consuming process that eats away at the farmer’s ability to focus on planting, growing, and harvesting. That’s where Dr. Aleksey Sheshukov and his team come in. 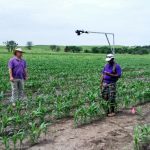 They want to assess ephemeral gully erosion by monitoring soil loss for ephemeral gullies on several no-till fields in Kansas. This will help them to evaluate the factors contributing to this type of soil loss by creating a predictive model. Once this model is complete, the team will use it to create a set of best management practices for farmers to slow ephemeral gully erosion or, better yet, keep it from happening at all.